If you want to play online uk slots and you are a fan of dogs then this one is for you! This canine themed 5 reel is one for all you dog lovers out there. Play your way through 25 paylines consisting of Alsatians, Chihuahuas, and mischievous Pugs but be sure not to miss the wise, old beagle who will act as your scatter symbol in this barking mad online slot game. Almost everybody probably has a slot game created by Eyecon among their favourites. That is due to the fact that this company’s portfolio features a vast selection of themes, so anybody can find something to suit their taste, while all slot experiences are developed with top quality graphics and bonuses that won’t ever leave you disappointed. 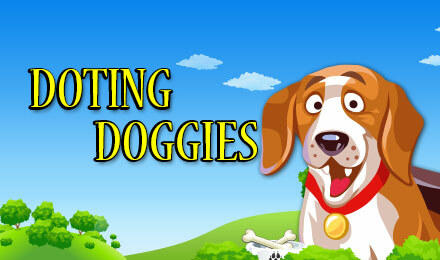 Doting Doggies will delight any animal lover out there, who’s ever dreamt of being in a room full of adorable dogs. Their cheerful spirit will transfer to you as you collect the prizes this slot game has to offer. Dog’s a man best friend, that’s a well-known fact. There’s nothing more endearing than a wagging tail and a cute fluffy face begging for a bit of affection. And who could ever resist those classic puppy eyes? This slot game will satisfy not only your heart needs, but also your wallet needs. Each dog has a lot of prizes to offer, along with unconditional love, and there’re a lot of breeds to choose from. So come and get lost in puppy love while the reels spin and you start winning. There’s nothing more you could ask for! Whether you’ve had a good day or a bad day, these puppies are here to brighten your mood and help you enjoy the simple things in life. Doting Doggies has 5 reels and 25 paylines full of love and happiness. The cartoon-like background and bark sounds add an even cuter touch to the slot experience, making you not want to leave. They’re all eager to see you spin the reel, so start placing your bets, starting from as little as 0.01 credits, then adjust the number of paylines you want to activate, and let the fun begin! Discover our top slot games here. 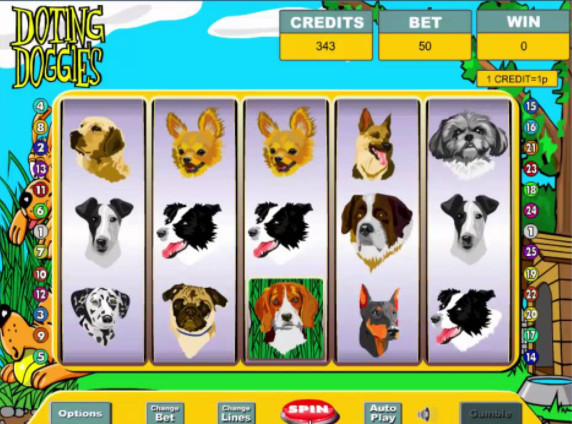 There’re eleven different dog breeds present on the reel, so it’s very likely you’ll find your favourite among this slot game’s symbols, whether that’s a tiny Chihuahua, the playful Golden Retriever or the sophisticated Poodle. Lots of puppy features are available for you to explore. The Dog Bone symbol is the Wild Card and it substitutes any other symbol besides the Scatter, in order to form more winning lines. All wins made with a Wild are also doubled. The Scatter is represented by the sweet looking Beagle symbol and if you spin 3 or more of them anywhere on the reel, you’re be rewarded with 15 Free Games. Moreover, all prizes won during Free Spins are tripled! Lastly but not least, if you’re feeling adventurous, you can try out the Gamble feature, and have a go at getting double or nothing! The puppies are, of course, always rooting for you. Get a free spins if you pay by mobile casino. Doting Doggies might be one of the most adorable slot games Eyecon has ever created, using high quality graphics to convey a friendly atmosphere, appropriate for the theme. You can have fun identifying all the breeds and looking forward to the barking sound that means you’ve won. This slot experience combines simplicity and cuteness, and animal lovers are undoubtedly going to enjoy it. A less doggie game for you to enjoy is now here, join today!